Deadshot wouldn't even think about heading out on a contract without the right gear. And that means he's going to be armed with the best from head to toe... and from wrist to wrist. This Deadshot gauntlet accessory set is officially licensed from the summer blockbuster and will be the perfect finishing touch for your Suicide Squad costume! Whether you loved Will Smith's character in the 2016 movie or you just want to bring one of your favorite DC comic book villains to life, when you have this amazing accessory set, you'll feel like a stone cold killer. Of course, they're just props so they won't help you with actual assassinations... 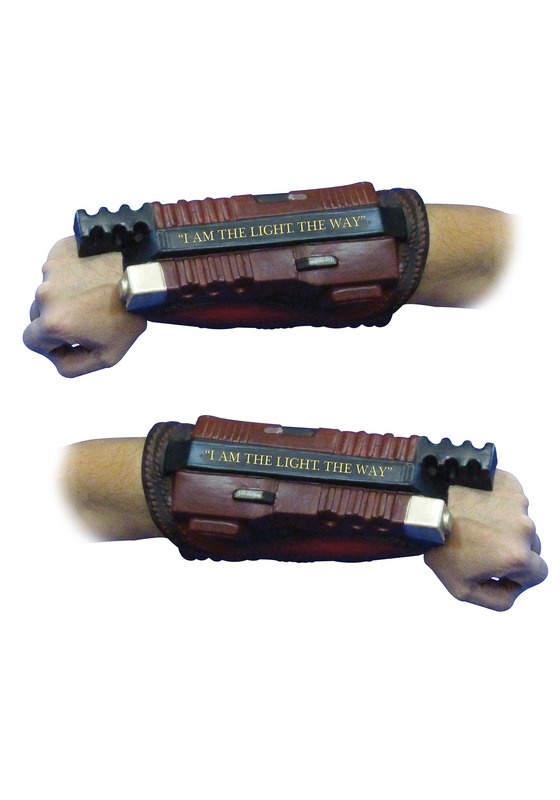 They do, however, have his signature phrase "I am the light, the way" printed on the sides for an authentic touch. Make sure to complete your Suicide Squad costume with this unique DC accessory set. Oh, and you might want to have a list of demands ready to go to just in case you happen to get drafted into a real life Suicide Squad!